1928 Elcar 8-91 Roadster. Saturday I saw my first Elcar automobile. Friday I told my 91 year old mother whom I was visiting that I was going to an automobile Concourse in South Bend where they would have some old classic cars on display. She then told me that her mother worked as a secretary for a automobile maker in Elkhart, IN for a time after she graduated from high school (around 1916) and that the car maker was called Elcar Motorcar Co. I had never heard of Elcar. Ironically, the very next day I saw my first one. The Elkhart Carriage and Harness Mfg. Co. starting in 1873 built horse drawn carriages, a Motor Buggy in 1908 and a great American Automobile called the Pratt-Elkhart (1909-1915). The Elkhart Carriage and Harness Mfg. Co. was a phenomenal success in the early 1900s and became one of Indiana’s largest businesses by the turn of the century. The Pratt Motor Buggy reflected its roots. However, the Pratt Brothers realized in 1914 that the Pratt-Elkhart was priced too high at $2,000.00 for most people. So in late 1915 they designed and produced the 1916 Elcar with a four cylinder engine A five passenger Elcar touring car and a two passenger "Clover Leaf" Elcar Roadster was produced for a low price of $795.00. 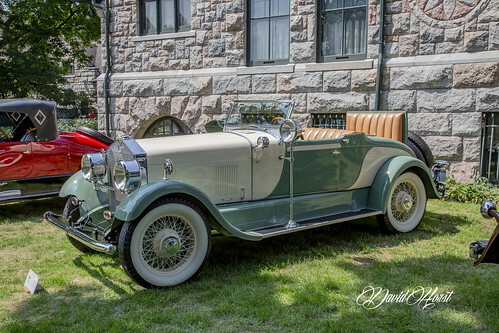 A four passenger touring roadster was added to the 1917 line. All three models were listed at $845.00 in 1917 advertising. When the country was gearing up for World War I, the company destroyed most of the horse drawn side of the business to make way for the building of ambulance bodies for the army in May, 1918. At the end of World War I in 1919, automobile production resumed for The Elkhart Carriage and Motor Car Company with a carry over of the 1918 models. Like most manufacturers, Elkhart Carriage and Motor Car Company had an immediate post war boom period. 4,000 Elcar units were produced in 1919 in spite of material shortages from their suppliers. In 1920 production decreased to 2600 units due to a tightening of credit. In 1921 William B. Pratt and George B. Pratt decided to retire from the automobile business. Their company was sold to a number of former Auburn executives and the name changed to Elcar Motor Company. 1900 automobiles were sold that year and 1300 the following year. About 2000 automobiles were sold each year from 1923 to 1929. However, the "Great Depression" changed this company like many other automobile manufacturers. By the end of 1931, The Elcar Motor Company was bankrupt and only built a few Taxi cabs from 1931 to 1933, when they closed the doors for good.